20" Ponderosa Pine - Hand tapered wood trunk with realistic textured bark. Individual 'wild branches" placed by hand to assure natural shape and symmetry. Flocked with static needle texture. Each tree has a 2-inch nail spike for secure installation. Ideal for O-Scale and large scale modelers. 24" Ponderosa Pine - Hand tapered wood trunk with realistic textured bark. Individual 'wild branches" placed by hand to assure natural shape and symmetry. Flocked with static needle texture. Each tree has a 2-inch nail spike for secure installation. Ideal for O-Scale and large scale modelers. 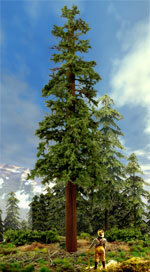 17" Tall Sequoia Tree - Mulit-Scale O-Scale and S-Scale operator. Ideal for the demanding Narrow Gauge modeler. Base measures approximately 1-1/4" diameter. 21" Tall Sequoia. Perfectly detailed for the demanding O-Scale operator and Narrow Gauge perfectionist. Base measures approximately 2¼" to 2½" diameter. 20" Premier Lodgepole Pine - Hand tapered wood trunk with realistic textured bark. Individual "wild branches" placed by hand to assure natural shape and symmetry. Each tree has a 2" nail-spike for secure installation. 24" Premier Lodgepole Pine - Hand tapered wood trunk with realistic textured bark. Individual "wild branches" placed by hand to assure natural shape and symmetry. Each tree has a 2" nail-spike for secure installation. 12" Douglas Fir - Premier quality! Hand sculpted to assure an individual realistic look. Pine boughs are plastic, flocked with durable foam texture. Heavy twisted wire stem gives thickness to the tree trunk. Every tree comes with a highly detailed hand weathered base. (Removable if desired). 14" Douglas Fir - Premier quality! Hand sculpted to assure an individual realistic look. Pine boughs are plastic, flocked with durable foam texture. Heavy twisted wire stem gives thickness to the tree trunk. Every tree comes with a highly detailed hand weathered base. (Removable if desired). 16"-18" Lodgepole Pines - An outstanding quality of hand-painted wooden trunks and finely detailed pine boughs. 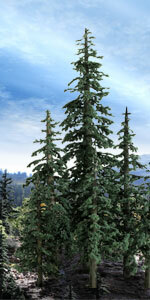 This set contains 2 extra large Lodgepole Pines ranging from 16"-18" tall. Dark green foliage with weathered trunk. Each sold separately. Foam textured with plastic trunk & limbs. 12" Tall. Medium green foliage with weathered trunk. Each sold separately. Foam textured with plastic trunk & limbs. 13" Tall. 13¾" Mountain Ash Tree - Medium green foliage with naturally weathered trunk. Buy 3 or more and Save! The perfect pine for eastern and western arboreal forests. Full natural shape. Delicate transparent canopy. A generic species of tree. Some find that this tree closely resembles a maple or bass tree. 12" Sycamore Tree - One (1) 12" tall Sycamore Tree. The Sycamore is often referred to as an "American Plane Tree". A lowland tree found mostly in marshy wetlands. Trees have natural light-tone trunk. 16" Sycamore Tree - One (1) 16" Tree. The Sycamore Tree is often referred to as an "American Plane Tree". A lowland tree found mostly in marshy wetlands. Trees have natural light-tone trunk. 18" Redwood Tree - Tall and majestic. Found in the nortern California Sierras. This tree is the narrow gauger's dream tree. Discontinued when sold out.